Dryophiops rubescens – Brown Whip Snake. Rear fanged. Not dangerous to humans. Relatively rare. Here is a whip snake that was a bit of a mystery for a while, it was finally identified by an American expat snake researcher in Bangkok – Michael Cota. This snake was found in Krabi province, and far north of where other instances of this snake have been found in Thailand. There were a couple found in the southernmost provinces – near Narathiwat – near the Malaysian border. Also known as: Red Whip Snake, Brown Whip Snake, Keel bellied whip snake, keel bellied vine snake. Description: The head of this snake is more brown than any other part of the body. Keep in mind there are red and brown varieties. The head is elongated and has a ridge between the eye and snout. Pupils are set horizontally. The body of the snake is slender – ideal for climbing through vines and light growth. The snake is measured in grams, not exceeding 300 grams for the largest of them. Scales on top of the body are smooth. The underside scales are keeled and are excellent for climbing. The whip snake I caught yesterday was able to climb up a smooth plastic water jug and grip it tightly. I was quite surprised. The head is brown, the neck and first half of the body is silver / grey and mottled with some black and dark grey. The belly is pale yellow under the head and neck, and toward the tail gets a coloration very similar to the top – heavily mottled and darker brown moving posteriorly. These snakes are more thin than my smallest finger. Range: Literature has this snake occurring only in Thailand’s deep south, but, this is the second instance of one found in Krabi province – so, obviously the range includes this province as well. Habitat: Trees and ground. I found both on the ground. They are excellent climbers and love vines and light brush. Recently we found one hanging out in the curve of a guardrail on a mountain in Krabi. Active Time? Diurnal, but possibly also nocturnal. Both of mine were found during daylight hours. Defensive Behavior: Accurate strikers! One of the ones we’ve had didn’t bite at all. The other tagged my finger striking quickly and very accurately. I bled slightly. No ill effects were noted. Venom Toxicity: Weak for humans. Effective for geckos, lizards and frogs. These are rear-fanged colubrids and a prolonged bite could cause swelling and pain at the bite site. Notes: These are really beautiful snakes resembling the Ahaetulla prasina in body morphology and Gunther’s Whip Snake. Studied closely you’d be amazed at the pattern in the body of the snake. Both of ours were brown whip snakes (we are guessing – there are few photos in the lit), there are also red-colored species of this snake. Found another one of these whip snakes – they are supposed to be either red or brown… I guess this could be called brown. The head is more brown. The neck and up to the stomach is silver… with some black patches… and then the tail is reddish brown. It could well be the red variety because as I compare photos with the other brown whip snake I had before – they are quite different in coloration. This one is predominantly silver – for the neck and down to the beginning of the tail. The tail gets dark – and there is a reddish tint to the brown… So, not sure. Lovely snakes. These are vine snakes and very fast in the wild. I found him on the ground amongst leaves and rocks… sandy dirty. He was about to enter an 8 inch diameter drain pipe. It did take a bit to catch him – and once I got him he was fine – no bites until I had to grab his tail to pick him up. He was not ok with that and tagged my finger very quickly – a little blood. There were people around and they were all screaming Pit Pit! (Venomous) It isn’t… Thais call all snakes venomous – which is part of the problem here – they kill any snake they see, insisting it’s venomous. The other part of the problem is that in Thailand there are 60+ venomous snakes. Most people can’t be bothered to study them all and know the difference. I don’t know all of them either. This one I knew though. 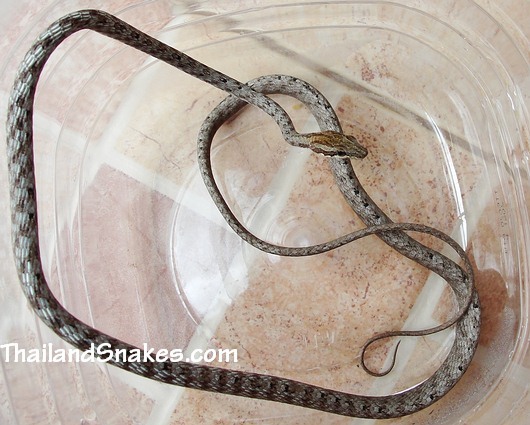 Great snake – will keep it for a couple of days and let it go where I found it. Common names: Keel-bellied vine snake; keel-bellied whip snake; brown whip snake; red whip snake (more red).